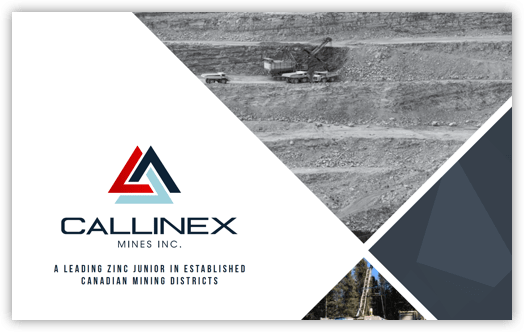 Callinex Mines is advancing its portfolio of zinc rich deposits located in the Bathurst Mining District and Flin Flon Mining District, where nearby operations are actively mining for zinc, copper, gold and silver. The portfolio is highlighted by its Nash Creek and Superjack deposits in the Bathurst Mining District of New Brunswick. Callinex is actively drilling these projects in support of an updated resource estimate and maiden Preliminary Economic Assessment. Additional projects include its Pine Bay Project, which hosts a high-grade copper deposit and strong exploration potential. The Callinex technical team has been credited with the discovery of numerous mines across North America that were rich in zinc, copper, gold and silver. Bringing together experience, skill and past performance, the people behind Callinex are committed to creating and enhancing value for shareholders.